Let me start by saying that this was a totally unexpected quilt. For a tiny bit of background, last year I participated in Kristen's Mardi Gras Swap & Challenge. 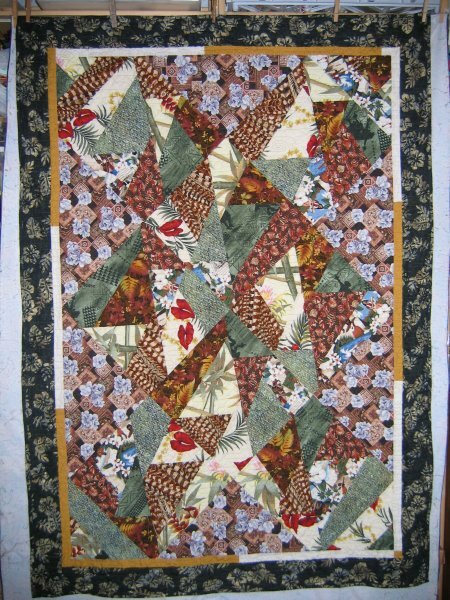 The Challenge part was to make a quilted something from the swapped fabric, send a picture to Kristen who would then post it (anonymously) for the Quilting forum to view & vote upon. The project that garnered the most votes would win applause and acclaim (and, as we found out .. a prize!). The project didn't necessarily have to be completely finished and in fact, we had a number of WIPs that were posted. To my delight and pleasure, my pillow was voted project #1. I gotta admit that being somewhat of a competitive person, coming in as "the most favorite" was a *real* ego boost! :-) although honesty compels me to say that if some of the WIP pictures had been completely done, I think the final outcome could have been very different. Anyway, the prize was a gift certificate to BarbaraSews' Fare Tahiti store! Talk about a golden opportunity! woo hoo! I took quite a while to look through Barbara's site and even longer to make a final decision. 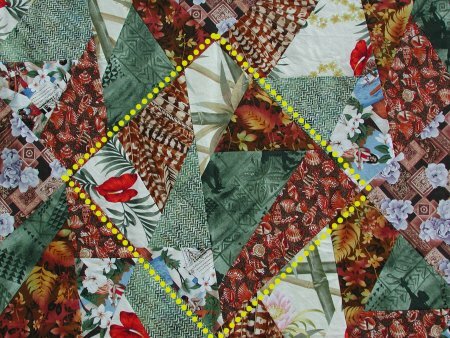 Hawaiian motifs and themes are not my normal choices, so stepping outside this particular box proved to be a horizon-stretching experience. I narrowed my choice to 2 selections: one was a multi-colored multiple strips of a border and the other was a Grab Bag of fat quarters. The other choice, the Grab Bag of fat quarters, offered more bang for the buck in terms of variety of fabrics, but I generally don't use FQs; they don't lend themselves to the kind of quilt designs that I do. However, getting 10 different FQ was a big attraction. Eventually I did settle on the Grab Bag. Barbara sent the squishy VERY fast: a lovely collection of 8 prints and 2 coordinating "solids" after I had said I was "planning" to making a scrap kinda quilt from the FQ selections. The problem with actually getting the squishy was that here was another "quilt in the raw" that was staring me in the face. It was preying on my mind and although I did have other projects that I was working on, I decided that I would simply DO something with them, just to get them out of my hair! An interesting side light ... when I was at the other store, I wasn't specifically looking for a setting triangle fabric, but when I saw the material, I realized it woud be perfect (or as perfect as my memory allowed .. it turned out to have light lavender flowers in it and none of the FQ had any shade of purple! But .. it turned out to coordinate rather nicely.... whew!) Unfortunately, I couldn't remember how much yardage was needed nor could I remember how big the final quilt was going to be. So there the top languished .. for years ... until I finally decided that I just needed to get some of my tops quilted. One reason I was accumulating so many tops is 1) I really like making the tops and 2) I really dislike the quilting process with my home machine .. it's just too difficult and frustrating for me. 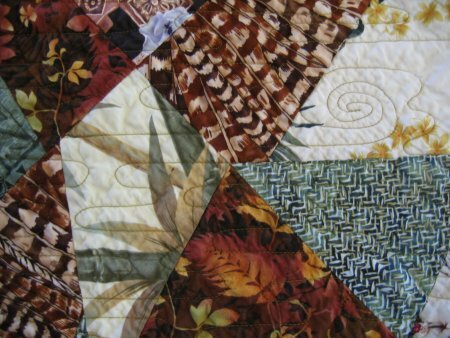 I gathered up my pennies (and nickles and dimes) and took the top and backing over to Janna Bailey of The Quilting Company. Janna has a wonderful, wonderful overall design that she calls "water ripple". I had further decided to give this quilt to Geraldine Mallia, a daughter of my Dad's lady friend. My Dad had suffered a nasty 3rd stroke in February 2005 and Geraldine was unstinting in her attention that she lavished on my Dad during his rehabilitation and recuperation. I absolutely, positively know that her frequent visits and flowers kept my Dad's spirits high and helped him to recover more quickly. I am very, very grateful to her for her thoughtfulness to my Dad.